Are Virtual Influencers Coming to China’s Luxury Market? The 23-year-old Japanese girl Erica is different from any influencer that Italian luxury brand Gucci has ever used in its marketing campaigns in China. Erica is an artificial intelligence (AI)-generated robot created by Hiroshi Ishiguro, director of the Intelligent Robotics Laboratory at Osaka University in Japan. She can talk via voice synthesizer but has yet to learn how to make facial expressions. 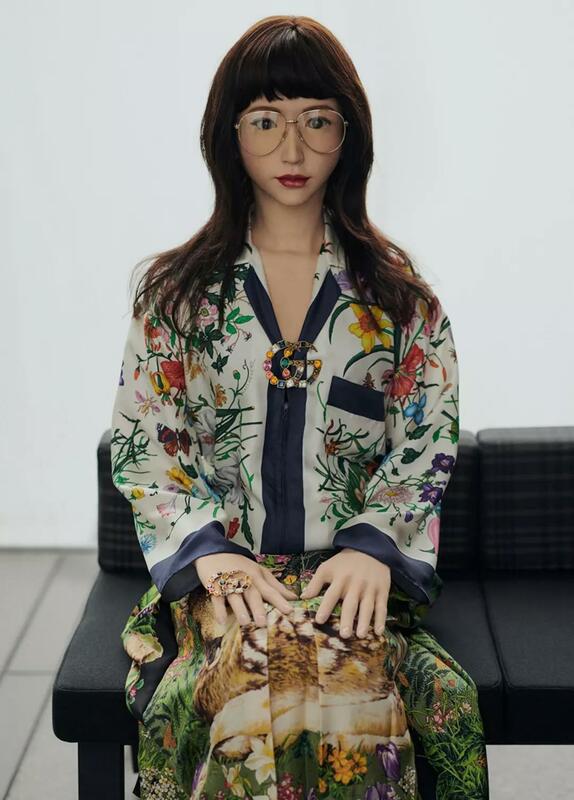 Erica, alongside Ishiguro and his clone humanoid robot Geminoid HI-4, was featured in Gucci’s WeChat campaign titled “Why are you scared of me?” on July 16. In the campaign, Erica was dressed in Gucci’s new collection from head to toe. That has made the Italian luxury powerhouse the first luxury brand that uses virtual influencers for marketing initiatives in the Chinese market. Virtual influencers, referring to influencers who are not real humans but robots or digital creations, are not a complete novelty in the Western luxury industry. There is a whole host of well-known virtual and AI social media influencers like Sophia the Robot, Lil Miquela, and Shudu active in the luxury and fashion arena. The most popular one is perhaps Lil Miquela, who was created by artists Trevor McFedries and Sara Decou as a digital art project in 2016. Lil Miquela is said to be a Brazilian and Spanish model, 19-year-old and based in Los Angeles. With over 1.3 million followers on Instagram, Lil Miquela likes to post her daily life and interaction with her real friends and claim to support Black Lives Matter. So far, her name has been associated with a great number of high-profile fashion and luxury brands including Chanel, Proenza Schouler, Veterments, and Moncler. Her latest fashion venture was with Prada, which she took over the brand’s Instagram during the Milan Fashion Week in February this year. The emergence of virtual influencers has sparked heated discussions on its advantages and drawbacks. Programmable virtual influencers are becoming much more attractive to brands as bad boys–and girls–increasingly misbehave, denting the brand’s image. Debra Davis, the founder of the VR and AR company NKLS, believed it is an easier management and control process for brands, and therefore, can help avoid reputational risk and controversy, that may be brought by virtual influencers than real influencers. The curiosity factor also makes virtual influencers appealing to luxury marketers. Back to the Gucci campaign mentioned earlier, this first experimentation with a Chinese audience seems to be off to a good start. The campaign post on WeChat has quickly reached over 10,000 page views since its release and been liked by nearly 400 users. In a time when luxury brands’ visibility remains low on WeChat, not too many posts can break 10,000 page views. Comments under it are quite positive. Readers are impressive by the imagination and coolness demonstrated by Erica in this Gucci campaign, and also, happy to be engaged with the brand on an intellectual dialogue on AI/robotics and the ethical dilemmas surrounding it. However, when asked if virtual influencers will have a promising future with consumers in China, Elijah Whaley, chief marketing officer of the China-based influencer agency ParkLu, reveals an inconvenient truth about this upcoming trend – virtual influencers are merely online personas fashioned out of the imaginations by real-life people. “Ultimately, the long-term popularity of these cyber-enhanced influencers will come down to their ability to create value for their audiences,” Whaley added.